The HP Laserjet Cm3530 all in one printer is a perfect solution for small offices, producing professional quality prints. This eco-friendly printer boosts productivity. It has built-in duplexer which allows users to print on both sides of the paper. The Laserjet Cm3530 is relatively easy to setup. As a stand alone device, the Cm3530 is a breeze to use. HP Laserjet Cm3530 toner cartridges are a bit expensive as compared to the other competitors lying in the same class. The device has 512 MB of RAM which is upgradable up to 1 GB.The scanner is located on top of the printer along with the 50-sheet ADF for making bulk copies. The colour touchscreen display is located below the scanner along with a small number pad, sleep button, reset button, stop button, start button, clear button and a display brightness key. The device is ENERGY STAR qualified. It also offers digital sending features, which allows you to send files from the printer directly to your e-mail. The printing resolution of this device is 1,200 x 600 dpi with print speed up to 31 ppm for both colour and monochrome files. The printer supports USB port and network ready ethernet connectivity. The HP Laserjet Cm3530 is a multifunction printer with print, scan and copy functions. The device is a good choice for small offices as it delivers professional quality outputs. The printer supports automatic duplexing, ethernet networking, USB connectivity and also offers digital sending features. However, it lacks wireless printing capabilities and fax functionality which are the major features found in the other multifunction printers. The high priced HP Laserjet Cm3530 toner cartridges results in high running cost of the printer. How to install your brand new HP Laserjet Cm3530 toner cartridges? Before you connect the cable to the printer, always unplug the printer. Otherwise, the printer might be damaged. Installation is complete. Your HP LaserJet Cm3530 Series Printer is ready to use. If you had any problems, see Troubleshooting the printer or go to HP’s support Website. Q. What is the RAM of HP Laserjet Cm3530 printer? A. This printer has a RAM of 512 MB which can be upgraded upto 1 GB. Q. Why should I prefer compatible HP Laserjet Cm3530 toner cartridges for my printer? A. Compatible toner cartridges can help you save your money by providing good quality results at minimum cost. The compatible toner cartridges can be easily used for printing without any worry to lose your printer’s warranty. Q. Will it make any difference to the number of pages I print, if I use compatible HP Laserjet Cm3530 toner cartridges instead of the original ones? A. Using compatible HP Laserjet Cm3530 toner cartridges makes difference in the cost of toner cartridges, not in the number of pages you can print. The number of pages that can be printed depends on the ink cartridge you use, as some cartridges state a higher yield. A. The print speed of this printer is 31 pages per minute for both colour & monochrome files and the printing resolution is 1200 ✕ 600 dpi. Q. Does the printer supports wireless printing? A. Unfortunately, the printer lacks wireless printing capability but supports USB port and network ready ethernet connectivity. Q. What are the operating systems compatible with HP Laserjet Cm3530 printer? A. The operating systems compatible with this printer are Apple Mac OS X 10.3, MS Windows 2000, MS Windows Vista and MS Windows XP. Q. What is the approximate month volume of pages for this printer? A. The approximate month volume for this printer is 2000-6000 pages. Q. Does the printer allow scanning and copying functions? A. Yes, the printer allows printing, scanning as well as copying. Q. Is this printer compatible with Windows 7? A. Yes, the printer is compatible with Windows 7. Q. What are the types of print media supported by HP LaserJet Cm3530 printer? Q. If I place an order for more than one multipack of HP LaserJet Cm3530 toner cartridges, do I have any chances of getting extra discount? A. Please see that we offer HP LaserJet Cm3530 toner cartridges or any other print cartridges with an exclusive discount on each product. If you buy two or more multipack of print cartridges it will greatly reduce the cost per page annually. Besides, we promise to process a 100% money back guarantee if you are not satisfied with the efficiency and performance of our product. So, ultimately you will be having greater advantages on buying a multipack or more which will save you more money in the long run rather than just availing the initial discounts. Q. Would you please precisely explain the eco-friendly features of HP LaserJet Cm3530? The HP products are blue Angel and Energy Star certified that proves it is designed with maximum amount of eco-friendly materials. Q. Can you tell me the name of all the compatible cartridges for my HP Laserjet CM3530 printer? Q. Could you tell me the way to insert the cartridge into the HP Laserjet Cm3530 printer? A. To insert or replace the HP Laserjet Cm3530 toner cartridges into your printer you should consult the user manual guide provided with the printer. If you don’t have the user manual guide you can also visit the HP support page to find video and instructions on how to replace or insert the toner cartridges in your HP Laserjet Cm3530 printer. You can also call our customer support on +44(0)28 308 33221. Q. 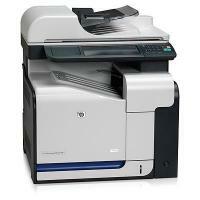 Hey, I have purchased a new PC and installed all the new drivers for my HP Laserjet Cm3530 printer in it. However, it is not recognizing my old cartridge. Do I need to install new HP Laserjet Cm3530 toner cartridges or is there some other issue? Before you proceed make sure you are using the HP Laserjet Cm3530 toner cartridges. Check the PC now, the message should be disappeared. Q. How do I load papers into the trays of my HP Laserjet Cm3530 printer? A. There are three paper trays in your HP Laserjet Cm3530 printers. Follow the steps below to load each of the paper tray. Open the first tray and fold out the tray extension to support the paper. Load paper sheets (that matches the print media specification of the printer’s first tray) in the tray facing down (keeping the smooth and shiny side of paper down). Put the sheets in the tray keeping the short, top edge going into the printer first. Adjust the side guides of the tray to make sure the sheets are firmly fit under the tabs on the guides. Make sure the side guides are not so tight for the paper stack , they should be lightly touched to the paper stack so the papers do not get bend. CAUTION: To avoid jams, never add or remove paper from Tray 1 during printing. Adjust the side guides of the tray according to the paper-length and paper-width of the stack you put in, by squeezing the adjustment latch and sliding the guides. Load paper sheets (that matches the print media specification of the printer’s first tray) in the tray facing down (keeping the smooth and shiny side of paper down). CAUTION: Do not print envelopes, labels, postcards, or unsupported sizes of paper from the Tray 2. Print these types of paper only from Tray 1.